Now that the season is drawing to a close, it’s time to look back and review what lessons I have learned from mistakes I have made. Planting Schedule – I made a schedule this year so I would not plant too early or too late. I based this schedule off of the first and last frost dates for our area per the farmer’s almanac. I followed this schedule so religiously that I panicked if it was 6pm and I hadn’t planted the seeds for that day yet. I learned that while it is important to use the first and last frost dates as a guide, it is just as important to pay attention to your environment and keep an eye on the weather. Just a few days can make a big difference. Next year, broccoli, okra and sunflowers will be planted much sooner. Stagger Planting – One of the practices I did not take advantage of was stagger planting. I planted all of my squash at the same time so that, when the squash bugs and vine borers attacked, I lost all of my squash at the same time. I will also take advantage of the space under the tomatoes. Late in the season, after pruning the bottom branches of the plants, I’ll plant peas underneath so that space is not wasted. An added bonus? Peas fix nitrogen. Polyculture – I’m a big fan of polyculture – using multiple crops to mimic the diversity found in nature rather than planting large areas with single crops. This practice served us well this year – in most areas at least. The problem came when all of the cherry tomatoes from last year shouted, “Me, me, me! Don’t forget about me!” They sprang up all over the kitchen garden, choking out herbs and other smaller plants. We should have dug them up once the sprouted and moved them somewhere else. Next year, if we have that many volunteers after the chickens get through with the garden, we plan to move these survivors out to the swales. We’ll plant them between our trees. We also need to do a better job of the using polyculture principles in the swales using a video series called The Permaculture Orchard put together by Stefan Sobkowiak. There are other minor setbacks here and there. Over or underwatering, over or under fertilizing, planting so that there is not a true walkway without soil compaction to name a few. Overall, I’d say we learned from last year’s mistakes and took steps to avoid making the same ones. As I detailed in a previous post, we’ve also had some major successes and additions to the homestead. 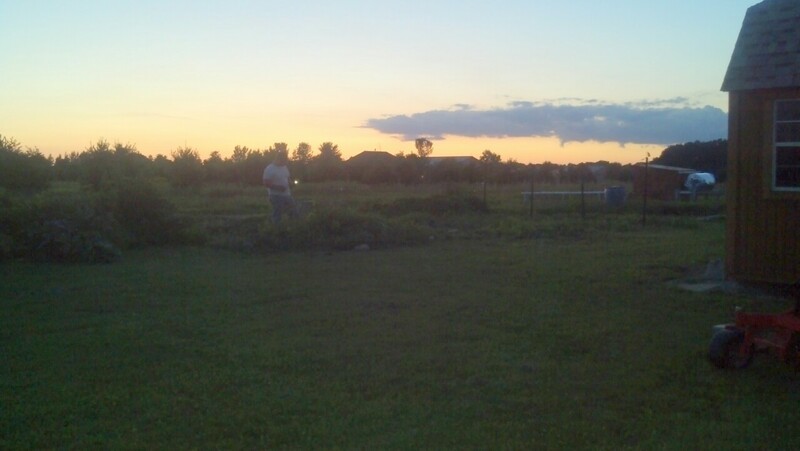 And, as I look out over the property…I feel pretty good about what we have accomplished. This entry was posted in 13 Skills, Garden Stories, Writing. Bookmark the permalink. Ours didn’t do very good last year. I get so discouraged by all the failures until I look back and see all the success we had too!